Pete Carroll is again gushing about Chris Carson, who in tandem with rookie first-rounder Rashad Penny, might have a chance to leave a mark from a new kind of Beast. 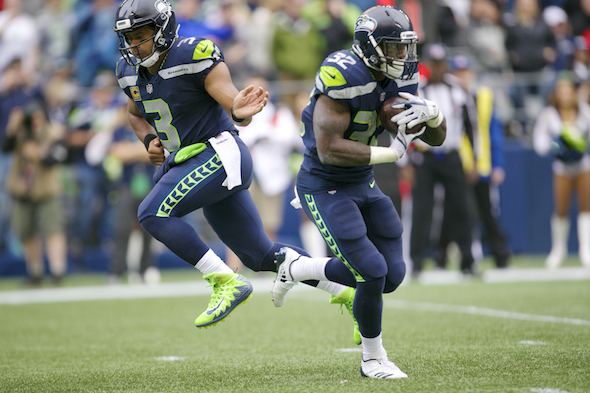 The presumption that Chris Carson, the seventh-round draft choice who as a rookie in 2017 was the Seahawks starting running back for three games, blew chunks in April when he saw his team take a running back with its first pick, misses a fairly large point. To get from where the Seahawks were in the running game to where they have to be, is going to take a platoon, if not a village. And a corollary point for the backs: The lighter the load, the more enduring the paydays. “The league is kinda getting away from single lead running backs,” said Carson after practice Sunday. “That would be great to do here. It can be a blessing, because it could prolong my career. Indeed, until the next Beast steps from some primordial ooze, the Seahawks would be well-served to create a two-man rotation for the restoration of dignity. Ideally, Carson and the pick, Rashaad Penny, the NCAA rushing leader last season from San Diego State, would trade shots in the power run game installed by the new coaches. Philadelphia: Jay Ajayi averaged 58.3 yards per game; LeGarrette Blount 47.9. New Orleans: Mark Ingram 70.9, Alvin Kamara 45.5. Atlanta: Devonta Freeman, 61.8, Tevin Coleman 41.9. In terms of average yards per carry, those teams were three of the top seven in the NFL. Not a single rusher last season averaged 100 yards a game. Only one, NFL leader Ezekiel Elliott (98.3) of Dallas, averaged 90. New offensive coordinator Brian Schottenheimer is all about the double-team. He recalled Sunday calling plays for the New York Jets. “Most of those years when we were running the ball really, really well, there was always at least two guys,” he said. “There was a Thomas Jones and a Shonn Green. There was a LaDainian Tomlinson and a Leon Washington. It takes more than one, for sure. The Seahawks had similar dreams a year ago. But Carson, 23, broke a leg in his fourth game, backup RB Thomas Rawls flamed out, Eddie Lacy was a bust, C.J. Prosise was hurt again and obscure Mike Davis led the Seahawks backs with 240 yards. The group combined for a single rushing touchdown, a ground feebleness unseen since Elmer Fudd fired shotgun blasts into empty rabbit holes. The Seahawks fired coaches, hired LT Duane Brown at midseason and added blocking tight ends and fullbacks in an effort to un-sissy the offense, in Carson’s view. Coach Pete Carroll is persuaded that Carson is his ideal guy for the job, particularly after early glimpses in training camp. “Where we left off, he was just getting going last year,” he said Thursday. “I think he would’ve been a very impacting football player on our team and we missed him, terribly. He nearly made it back last season. Ahead of the week 16 game on Christmas Eve against the Cowboys, Carson said he had completed his rehab progression to the point where he was two days from returning to practice when he had a minor injury setback. The crash of the running game left the door open for a draft, so Carson said it was no surprise the club went for a back in the first round for only the third time in its history (Curt Warner, Shaun Alexander). In short-attention-span America, it was easy to forget the Seahawks had one stashed in the infirmary. Of course, no discerning fan will accept at face value Carroll’s view that Carson is the real deal — this is the same coach who hailed Lacy a year ago — but there is at least a strong possibility that two will prove better than none, and may equal one. I read Carson added 10 lbs and is in fantastic shape . I’m seriously excited about Penny , if you watch YouTube highlights the kid can do it all ; sweep outside with great speed , put his head down and run between the tackles , catch it out of the backfield .. AND he’s a terrific returner . With added blocking help from the tight ends ( and hopefully a fullback – cough , Khalid Hill ) , hope springs eternal we can have a plus running game this season . I watched the San Diego State/Stanford game last year and have been salivating over Penny since. This is the first time since Earl Thomas I’ve been excited about a Hawks first rounder. I’m more excited about Brown, not only in the game but in the locker room, but I think our group of RB’s is very good with varied talents – all they need are seams . . .
Brown will be a difference maker in the Walter Jones tradition. I’ll take your word. My Aztecs history is weak. The D was transcendent when they didn’t have to be on the field all the time. If they can eat the clock and score with these two and the improved line, this defense which is looking kind of suspect will probably surprise us. I still think their ceiling is feisty 9-7, but that’s better than 4-12. You’re upon the general premise — control the line of scrimmage, thus the clock, with an NFL-average run game that will shrink the number of possessions against a vulnerable defense. Art: I am sorry but your Elmer Fudd reference doesn’t really work as a corollary for the ground game. Perhaps Wile E. Coyote?